Cooler weather is here and just in time for the cold water kayaking days is the newest kayak from Ascend, the Ascend H10 which is due out soon. The Ascend H10 hybrid sit in/on kayak is a scupperless kayak that takes great features from canoes and kayaks and blends them together. The Ascend H10 is the little brother to the Ascend H12, a longer version of the H10. At 31 inches wide, 10 feet long, weighs just 55 pounds, the Ascend H10 boasts a weight capacity of 400 pounds. It will retail for $599.99. Building on the reputation of the 12 foot version, the Ascend H10 has front and back mesh covers for holding areas. These are perfect to keep covered if you need sun protection, or take off and roll up to stow if you’d like to put a cooler, backpack, camp roll, dog, or even a small child. The covers are included and both are the mesh covers unlike the H12’s hard cover for the front hatch. Stability is still great in the Ascend H10 and will see a lot of people being able to stand and fish or just stand and paddle if they’d like because the seat and foot wells are below the waterline while the sidewalls of the kayak offer mid calf support to add stability. Even though the Ascend H10 is two feet shorter than the H12, the amount of gear track available for attaching accessories is exactly the same. Lots of real estate to mount GoPros, fish finders, and paddle holders. The chair is comfortable, vented in the seat pan, and allows circulation for hot days on the water. The chair rests into different locking positions and can be secured on each side with bungees. This also creates a pivot point so if you need to flip the seat up into the vertical position to be out of the way for standing, it moves with ease. The seat also has a couple of cup holders built into it, perfect for holding a canned drink or some quick access to baits. The glide on the Ascend H10 is great. It holds a line well and continues the momentum of the paddle stroke without drifting aimlessly left or right. With aggressive paddlers you might experience a little bit of side to side nose walk but it is one of the straightest paddling 10 foot kayaks I’ve ever paddled. The front and rear mesh covers for the hatches utilize J hooks that the bungee cord laced into the covers hooks onto. These are all above deck and can grab fishing line, rods, and other on deck items. I’d love to see the J hooks either moved below deck or for a different fastener style like Velcro to be used. Fewer plastic protrusions on top of the deck mean fewer breaking parts and fewer snags. I’d like to see a more elevated seat. If a design where the seat could sit four to six inches off the deck is possible to add more under seat storage I’d love to see it. A padded side wall for shoulder carrying would also be a nice added feature to this kayak. At 55 pounds it just begs to be hoisted over a shoulder and carried to the water. The side walls are tall and will catch some wind so an anchor system or drift chute system would be beneficial if you are in an area prone to wind. Tall walls mean lots of drift. If an anchor trolley on each side were premounted that would be highly beneficial. The Ascend H10 is not only a hybrid kayak but also a hybrid use kayak which is perfect for recreational paddlers and anglers alike. It boasts ample cabin room for storing lots of gear or a pet as a paddling companion. 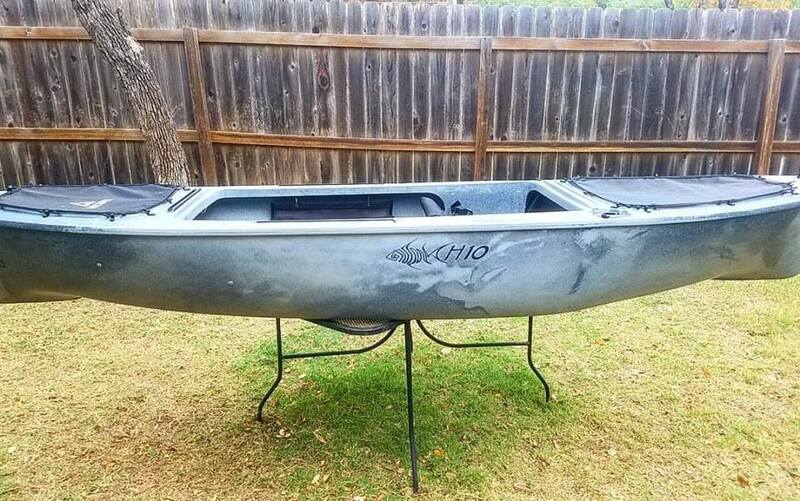 If you want to stay dry and stable, this is a perfect kayak to throw in the back of the pickup or on top of a car and hit the water. Jimmy,this is a newer, smaller version. It’s not out yet. The one you’ve seen is the H12. Similar for sure but much lighter and fits better on a car or bed of a pickup. And $100 less. Any idea when it will be available for purchase? First part of 2018. January is what I heard most recently. Any opinion on this vs the h12? I’d like to get this to save on the weight not to mention the price, but not necessarily at the cost of better overall speed/tracking abilities. The H10 will turn quicker than the H12 but the H12 will track better. I’m 6’2″ and 210lbs and fish out of the H10 just fine. In fact, I prefer it over the H12 because I can easily put it on my shoulder and walk with it. How dose the h10 handle windy days with waves. And Wich one the h10 or the h12 is a faster? 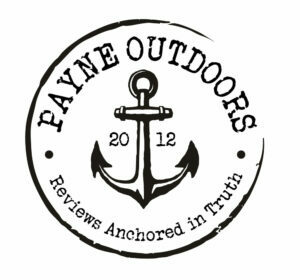 Thanks for the review on this kayak. I like the idea of a 10 foot boat to just toss in the back of the truck. I’ve been considering this one or the Ascend 10T for a simple fishing boat on slow moving rivers or still lakes. Any opinion on the H10 vs. the sit on top 10T? I much prefer the H10. More stable, lightweight and paddles better in my experience. Chris, I have a friend interested in the Ascend H10 Hybrid and I have a WS Commander 120. How would you say it compares to the Commander? It’s actually pretty similar. The big difference will be in the height of the seat. The Ascend seat sits lower in the water column. The Ascend being two feet shorter will turn easier though. I am VERY interested in this hybrid. Coming off years of big canoes, I just can’t (don’t want to) lift them up on and off my Jeep anymore. Is this something light enough to hoist over head and slide onto the racks from the side of the vehicle? Thanks for the article, good read and info! Absolutely it is light enough. ‘Does the h10 maneuver better than the fs10? Some reviews indicate that these kayaks are very difficult to turn. Is it so bad that it couldn’t be used in rivers? My son has been paddling this kayak since he came out. He started using it at 5ft tall and 85 pounds. He could turn the H10 in wind and current just fine. Not sure which reviews you were referring to but I’ve not found it difficult to turn. That being said, I would not take the H10 on a river with rapids because of the type of boat it is. You’d want something with scupper holes in case you flipped. Has any tried any of the yeti products on the H10? Does the cup holder hold a 32 oz tumbler? Does the tundra 45 fit anywhere on it? Or the Hopper? Will the Yeti bag fit under the front? Does the load out bucket fit on it? And can you attach a sidekick to one of the sides where the ascend pouch is? Many of the YETI products work with it. I use a Hopper backpack usually and the dry pouches work fine. I’m looking at both the H10 and H12 after I heard the 12T and 128T sit on top kayaks got some bad reviews.Weight was one of them.The H12 would be my choice.Roomier than the H10 and not much heavier.